The connection between mother and child is stronger that what we already know. Scientists have found out that when the fetus develops inside the womb of the mother, its cells travel through the placenta and mix and mingle with the mother’s cells. These cells can also remain for years inside mothers. 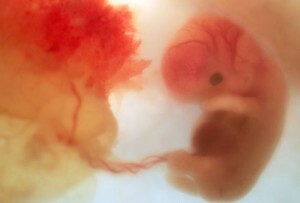 Researchers from the Tufts University have found cells from the placenta and the fetus in a mother mouse’s lungs. The authors were also able to identify some of these cells as immune cells and others as under developed connective tissues. The researchers have yet to find out how the baby’s cells can get to the mother’s body via the placenta but they believe that the process happens because of few leaky spots on the cells that form a barrier between the mother’s blood and the baby’s blood. As the pregnancy progresses these spots enlarge allowing the transfer. To understand the process better, the researchers mated a male mouse that had two copies of the green fluorescent protein with a female mouse. The babies all had the fluorescent protein and therefore when these fetal cells went to the mother’s organs, the researchers were able to identify them. Next the researchers tried to find what exactly was the nature of these cells that had migrated into the mother’s organs and found that the genetic makeup of these cells was similar to immune cells and that of mesenchymal cells that make up the connective tissues. The researchers believe that the immune cells may be playing the important role of ensuring that the mother’s immune system does not reject the baby as a foreign body. But they are not sure about the role of the connective tissues. They suggest that these cells could be helping in healing mother’s tissues as they were found near the lungs and also found near tumors in some cases. The researchers also saw them near maternal heart tissues when they were injured. The study was published in the Biology of Reproduction.